The Economic and Financial Crimes Commission said it has declared a former Director-General of the National Intelligence Agency, Amb. Ayodele Oke and his wife, Folasade, wanted for refusing to appear in court over N13 billion money laundering charges leveled against them. The anti-graft agency announced this in a statement yesterday by its acting spokesman, Tony Orilade. The statement said Oke and his wife are wanted in connection with the $43 million, £27,800 and N23.8 m cash recovered by the commission from an apartment at Osborne Road, Ikoyi, Lagos, in April 2017. During the tenure of the former DG, the NIA reportedly collected $289,202,382 in cash for special operations from the account of the National Petroleum Investment Management Services at the Central Bank of Nigeria in February 2015. Oke had claimed that the funds were meant for covert intelligence operations, but the Federal Government insisted it was a case of looting. Consequently, the federal government set up a three-man panel headed by Vice-President Yemi Osinbajo which indicted Oke and recommended his dismissal. Following the indictment, Oke and his wife were said to have travelled overseas for medical treatment in late January this year preluding their arraignment in court. 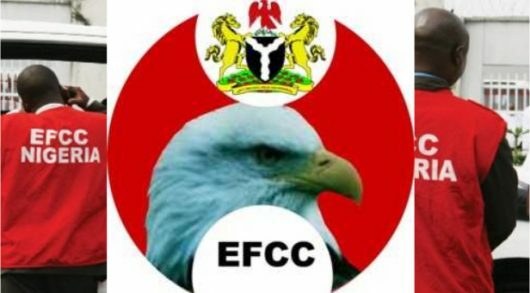 Justice Chukwujeku Aneke of a Federal High Court Lagos, had on February 7, 2019, issued an arrest warrant against Oke and his wife following an oral application by EFCC counsel, Rotimi Oyedepo.